As I get older, I find myself gravitating to fewer and fewer regions to slake my thirst. This is not to say that I don’t relish trying new wines or making the veritable “world tour of wine” on any given weekend, but when it comes to every day drinking, I find my stops are limited to only a few vineyards. One of those vineyards is inevitably in the Veneto in northeast Italy, home to many of the world’s most well-known wines. Like many regions in Italy, the Veneto has been experiencing a bit of a rebirth over the last decade as winemakers use a combination of technology, flexibility and artisanship to make their wines better. Combine these efforts with the positive support of Mother Nature and you have all you need to put a smile on most wine drinker’s faces. It’s no secret – scroll through my posts and you will find that the Veneto is clearly a favorite, especially Valpolicella. More often than not, I’m posting about this Amarone, or that Vino di Ripasso, extolling the virtues of their complexity and drinkability. Admittedly this may appear myopic, as Amarone and Vino di Ripasso are a small contingent in the “sea” of wine flowing from the greater Valpolicella region. Enter Ca’ La Bionda, a small, fourth generation producer in the commune of Marano di Valpolicella, in the heart of the historically “classic” area of the Valpolicella. The winery was founded in 1902 by Pietro Castellani a truly passionate and dedicated grape grower and wine-maker. Fortunately for us, Pietro imbued his successors with the same love and passion for grape growing and wine making, because today, members of the Castellani family continue these fine traditions. All phases of the wine-making process, from the cultivation of the highest quality grapes, to grape harvesting, vinification, and ageing are all carried out directly by the family. Ca’ La Bionda does produce Amarone (two actually), as well as a Vino di Ripasso. They even produce a Recioto dessert wine, but experience has taught me that the measure of a winemaker’s ability is best found in their mid-level offerings. For this reason, the CasalVegri bottling is a prime candidate for study. 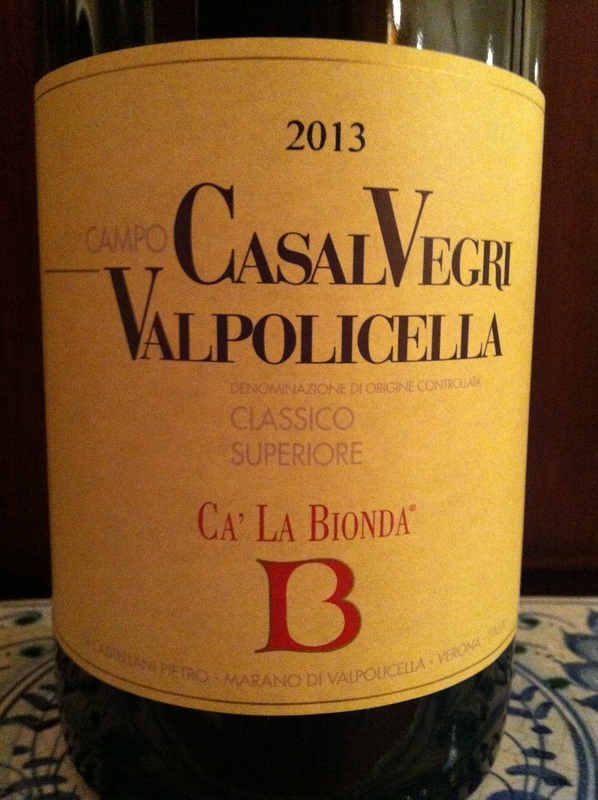 The wine is made from grapes grown in the estate-owned CasalVegri vineyard. The family feels that all of the contributing factors to great winemaking, micro-climate, soil composition and hill-side topography, combine to enable the production of some really terrific wine. The family is so confident of the wine’s potential that they have made the conscious decision to use 100% of the grapes grown in this vineyard for the making of a single Valpolicella Classico. The family does not cull the best of the crop for Amarone, nor do they employ the “ripasso” technique, in their opinion, “to correct” the shortcomings of the vineyard, both conscious decisions that produce a wine of exacting purity and character. The wine is the usual blend, consisting of 70% Corvina, 20% Corvinone, and 10% Rondinella. The vineyard soil is mainly clay-limestone with a high proportion of rock and stone, which contributes minerality and structure to the resulting wine. The vineyard is located on an east-facing hillside, at between 300 and 900 feet above sea-level. The elevation and orientation promotes slow maturation and ripeness, which contributes to the finesse and elegance of the resulting wine. Fermentation occurs in temperature-regulated stainless steel tanks at a temperature of no more than 77°F, which is relatively cool and ensures the preservation of the delicate flavors and aromas present in the grapes. Following fermentation, the wine is aged for 18months, 90% in large 3000 liter (792 gallon) barrels and the remaining 10% in 225 liter (59 gallon) barriques. The wine undergoes a further 6 months of bottle ageing before being released to the public. Overall the wine is a charming quaffer with hints of fresh cherry and violets in the nose and lively, spicy fruitiness on the palate. Well-balanced with well-integrated tannin, the wine exhibits moderate length and a layered complexity on the finish. The wine is drinking well now and should continue to improve with another 5 to 7 years in the bottle. At the average price of $19.99/bottle before discount, this wine is a very good value and makes a worthy addition to the cellar.